Tonight our family invested in another viewing of Back to the Future, the classic 80’s tale of the Delorean time machine and our hero, Marty McFly. Marty is transported to 1955 and has to see that his parents fall in love to assure his future existence. To be honest, I have been looking for a reason to blog about this movie. It was the movie of my youth. One that influenced me and has remained one of my favorites. I have also found that when I “geek out” on the 80’s, I tend to get a tremendous amount of traction on my blog posts (see my MacGyver post). My kids and I thought it would make a great post to illustrate some of the best practices of inbound marketing for education. My oldest boys have started to really get excited about sharing their opinions about what is important to them as they start to shop for colleges and are in full agreement that inbound is the future of marketing. With that, we collaborated on this post and decided to use our favorite quotes to set out best practices and strategies for inbound marketing for education. Doc Brown had his vision for the Flux Capacitor after slipping from the toilet and hitting his head on the sink in 1955. That vision developed into his greatest invention: time travel. Be sure that your website, emails, and social media is done with style. Pay attention to design, typography, images, and color. Prospective students understand and appreciate style and high quality. Style is the vehicle for engagement. Remember that your prospective audience wants to learn more about your institution, but doing so with excitement, entertainment, and style will create opportunities for engagement. Be sure to do so in an authentic manner that reflects your brand. Style without substance is just a shallow fad and won’t produce the results you intend. Takeaway: Develop your inbound marketing materials with style and quality. Doing so will best reflect your brand and create authenticity and engagement opportunities. Those words were uttered by Emmett Brown at 1:15 a.m. at the Twin Pines Mall while engaging in the Temporal Displacement experiment. He had done his homework, reviewed the metrics, and understood his potential for return. Is your current marketing strategy and plan as measured? With outbound marketing, schools often rely on the “spray and pray” mentality: send out the brochures, the emails, and pray that the prospects will start trickling down the funnel. Inbound marketing can change that. Create compelling, relevant, and timely offers in exchange for moving to the next part of the funnel. Discover what drives your prospects and provide them information to answer those questions. Would an ebook devotional guide be worth putting their name on an inquiry list? Would a guide to “20 questions to ask during your campus visit” be useful to move them to sign up for your visit days? Utilize the correct tools and techniques to leverage inbound marketing to its fullest. Measure and modify. By doing your own calculations on the metrics from all aspects of your program (website, social media, email, conversions on landing pages, etc.) you can confidently predict your serious success as well. Takeaway: Use the inherent metrics available in digital and inbound marketing to confidently modify and see sustainable results with your marketing programs. Powering time travel takes a tremendous about of power and energy. For Marty and Doc it came down to either plutonium or lightening. 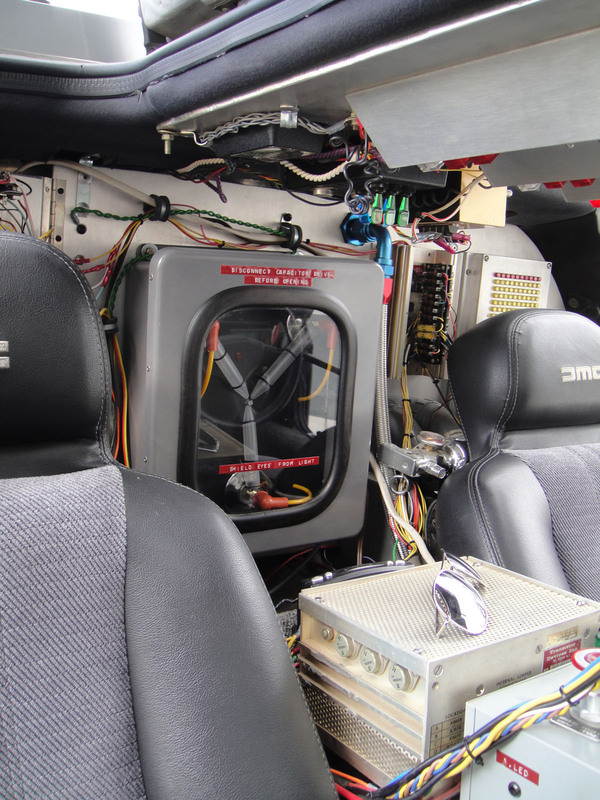 Regardless the method, it is a lot of power required to fuel the Delorean. Your inbound marketing program will require just as much power. Your fuel comes from content. Content marketing is a key driver of inbound marketing. With Google’s algorithm change over the past 12 months, consistent content around the same topics drives search results. Blog posting is one of the best ways to consistently rank for your keywords (i.e. marquee academic programs). Content is also the fuel for your social media and email programs. Answering the questions that students and parents have is a great way to start to build your content library. Content can come in various forms…it does not have to be only copywriting. Consider video, infographics, photography, quotes, statistics, audio, and other rich media options to provide depth. Provide breadth to your content by leveraging various delivery methods including long-form narrative, storytelling, lists, interviews, etc. Takeaway: Develop a content strategy to fuel your overall inbound marketing program. Successful inbound marketing takes power and fuel…and the only fuel that works is consistent, high-quality, relevant content. Contact us to schedule a content training for your team. Huey Lewis, in his cameo appearance, uttered these words concerning his hit “The Power of Love” as Marty and the Pinheads performed during the Battle of the Bands audition. He made a great point about using social media in your inbound marketing plan: avoid being to darn loud. Social media amplification is a critical part of your inbound strategy. You have to engage users to your social media channels and provide links to the website, landing pages, and other conversion opportunities. Your institution starts to get “too darn loud” when you promote only yourself. According to studies, 70% of prospective students found a school’s social media channels moderately to extremely influential in their research about college. Only 40% found the content relevant to their needs, meaning that the content was too loud in self promotion and not addressing the questions that they had. A good rule of thumb is 80% of your social media content should be shared from other sources (i.e. Real Simple ideas on dorm room essentials, the truth about the Freshman fifteen, or common sense about campus safety) and 20% should be your school’s press releases, events, and original content to drive conversion points for inbound marketing for education. Use social media correctly to build the following and become a true resource for your prospective students and parents. Takeaway: Be helpful in your inbound marketing. After George McFly was encouraged by Darth Vader, an extraterrestrial from the planet Vulcan, to ask Lorraine to the Enchantment Under the Sea Dance, he consulted with Marty, gathered up his confidence and boldly asked her out. While his wooing wasn’t as smooth as it should have been, he understood the importance of persuasion. There is a good chance your school is the destiny of your prospective students as well. Just as George used the power of persuasion, your inbound marketing for education has to provide compelling offers to woo your audience. Create compelling and engaging headlines. Creative headlines coupled with photos will be the most engaging social media posts and emails with the most opens. Provide offers that your audience can’t refuse. Your inbound marketing should include content that the audience wants and needs that is exchanged for the permission to provide them additional communication and offers. Approach your audience with the benefits of why your college is the best fit for them. Benefit-driven marketing, through their eyes, will help them to connect and see how they can best fit on your campus. Takeaway: Understand that your marketing is the opportunity to woo your prospective students and parents with the unique benefits of your school and brand. In the final scene, Marty gets carried away while playing “Johnny B Goode” and throws in elements of 80’s rock-and-roll. The 1955 crowd stares in unbelief as he utters these words. When building your inbound plan and elements, recognize that your website and your social media has multiple audiences. You cannot be all things to all people. Be relevant to the audience and address them appropriately by segmenting your channels, lists, and messages. There is no reason you should limit your institution to one social media account: you may need a Twitter account for prospective students, one for parents, and yet another for specifically regarding donors and friends of the college. Take time to segment your lists in the same way so that your emails contain the specific and needed communication that is relevant and meets the need for the particular audience. Use data variable elements in your communication to assure that the method and message work in harmony. Takeaway: Be relevant for your particular audience, recognizing you have multiple audiences. Marty and Jennifer were anticipating things being the same in the future when they inquired about not having enough road to get up to 88 mph. While we weren’t anticipating flying cars by October of 2015, things have changed. Ripley’s Believe It Or Not points out numerous predictions from Back to the Future that have come true. For our purposes surrounding your inbound marketing, the main point is to understand and get comfortable with the consistent change in digital marketing. Embrace that change and put it to work for your marketing efforts. Rely on experts to provide you regular updates on the best practices and next practices for your marketing efforts. You can’t do it alone. Learn new skills. Jay Baer, in his book Youtility, illustrated a great point: at one point there were dedicated jobs for typing and making copies. These have now been migrated to skills that professionals need to possess. Social media is a job that will soon be a skill. Understand it and learn it. Be sure your processes and techniques are adaptable for new opportunities. Remember, content is the fuel; your vehicle may change. Takeaway: Embrace change and build your processes to allow for continual improvement. Throughout the movie, Marty repeated gave this advise to the younger George McFly in 1955. Upon his return to the revised 1985 with George as the confident father, Marty is on the receiving end of the same advice. Remember that you if you set your goals, measure your results, and have the willingness to constantly modify and improve your programs, you can accomplish your inbound marketing goals as well. It will be different than what you may have done before, but with a sound strategy and solid tools, you, too, can accomplish anything. Establish goals, strategies, tools, content subjects and calendars. Regularly review your metrics and provide constant improvement on your system. Create a pilot project to establish baselines against your other marketing efforts. Takeaway: There is no time like the present to start realizing how inbound marketing for education can impact your success this year. What’s your favorite part of the movie and how would you apply it to your inbound marketing for education? Want to get your education marketing off the ground and running at full speed? Get ahold of us — it’s free and there’s no obligation.